Dale Farm in Essex was Europe's largest traveller site. 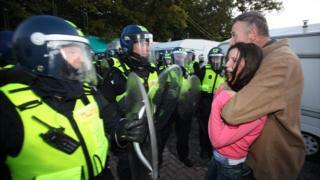 The eviction of 80 families from their illegally-built homes left 15 police officers injured and saw 45 arrests. Five years on, some of those involved assess the lasting impact of the evictions. The roots of the Dale Farm story stretch back to the 1970s when 40 English Romany families were allowed to live beside an illegal scrap yard in Essex. Settled residents who lived nearby remember this period as one of relative harmony and acceptance. Then, in 1996 Dale Farm was sold to an Irish travelling family for £122,000 and things, the residents living nearby say, changed. 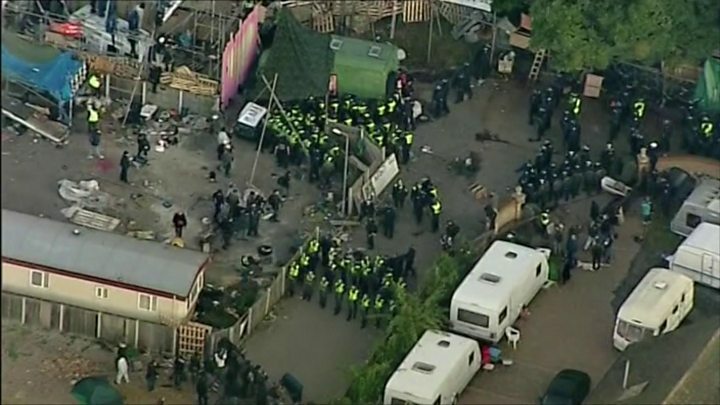 By the time of the evictions in 2011, there were twice as many illegal plots at Dale Farm as the 40 authorised ones. About 400 people were thought to be living there illegally. While travellers and their supporters demanded permission to remain, claiming they had nowhere to go, Basildon Council and residents fought for the upholding of planning law in the face of a massive breach. The row, which escalated all the way to the House of Lords, was ended with bailiffs and riot police clearing the illegal plots. To date, Basildon Council has not recouped any of its £4.3m eviction bill (the separate policing cost was £2.3m). "To be honest, I do miss my neighbours who used to live here," says one man. He - like all of the travellers who speak briefly to the BBC - does not want to be identified. "But things here are looking up. Everything is fine and it is looking good. "We have had a problem with fly-tippers but the council (Basildon Council) says they will be coming to sort it out." But he returns to the subject of his neighbours. "There are not the people around here any more. The people down the road have gone. "Has it been five years? Well it doesn't feel like five years." Dale Farm early on a Tuesday is a scene of smartly-dressed children heading off to school, men heading out in vans and adults smoking cigarettes behind open caravan doors. Most of the travellers approached by the BBC politely declined to share their memories of five years ago, or say what had happened to their former neighbours. Some claimed they had only recently arrived and did not know of the site's history. Another resident, a man in his 30s, believes the evictions caused more problems for the authorities than they solved. "They (the evicted residents) are now all over the place, it was a terrible experience for the children," he says. "They are all over, on supermarket car parks and the like. "It must be costing them (councils) all this money, but it has created a problem for themselves which they didn't need to create. "There wasn't a problem when people were living here." "It was a personal tragedy for the people involved," says Malcolm Buckley. "Let's make no bones about it, Gypsies and travellers do not get a fair deal from society." As former leader of Basildon Council, Mr Buckley was one of the architects of the eviction process. "Nevertheless, they should comply with the law of the land. This was not the case in this instance (Dale Farm)." Still working in local government, Mr Buckley recounts how the issue of Dale Farm escalated over a seven-year period. "It started off with a fairly simple retrospective planning application after they had developed the site. Then it went through the normal process, was rejected and then appealed and then there was a challenge through the High Court. "Eventually there were other factors such as human rights brought into play and it ended up at one point where we were in the House of Lords for a determination. "Ultimately, it was determined that the law of the land should prevail. "I think that's right and proper." "It could happen again," he adds. "But because we've already trail-blazed through the legal process, that process should now be a lot simpler in the event of a recurrence here in Essex or anywhere else in the country." He says one of the lasting effects of Dale Farm was the engendering of a fear of "Dale Farm II". "Everybody is frightened it is going to happen in the same way," he says. "Nobody minds a site for a dozen of 15 pitches but people are worried if that gets permission it would become a Dale Farm Mark Two." "Dale Farm happens on a smaller scale every single day of the week in Essex and across the home counties," says solicitor David Enright, who represented some of the Dale Farm travellers. "Travellers and Gypsies are still being forcibly moved on and we are blaming them for something over which they have no control. "There was a change in the law last year which means that in order for a traveller to be allowed to live on a permanent traveller halting site, a traveller must prove that they travel regularly. "In effect, the new government policy forces Travellers out onto the road where they may come in conflict with settled people who object to their presence. "The difficulty here is that people do not want travellers living near them and local authorities do not provide authorised sites to travellers so they effectively have nowhere legal to go. "They are forced, through a lack of provision of suitable sites, to live in unauthorised sites which brings them into conflict with settled people. "If settled people are angry that travellers are living on unauthorised sites, they must direct that anger at local and national government who refuse to provide suitable authorised sites and who now literally force travellers to travel through new planning policy." "Travellers don't want to be in conflict with anyone - they want to live ordinary, normal and safe lives that are not in conflict with anyone," he adds. "The law of the land forces them into conflict with settled people. "The answer is simple, provide sufficient authorised halting sites for Gypsies and travellers. "My firms represents scores of travellers and gypsies who are denied service in hotels, bars, bowling alleys, holiday parks and many other types of services simply because they are Gypsies and travellers. "I must emphasise, not because they have caused any trouble of any kind, but simply because they are travellers." The BBC's request for an interview with a senior Essex Police officer involved in the evictions was refused.